An inside tour of NASA facilities and Ellington Field - S&K Technologies, Inc. The Neutral Buoyancy Laboratory pool holds 6.2 million gallons of water and can even fit a mock up of the International Space Station. The February NASA Contractor Affairs Safety Committee Meeting was held at the Neutral Buoyancy Laboratory (NBL) at the Sonny Carter Training Facility in Houston, TX, and the S&K Global Solutions EPIC Team was represented and in attendance. The NBL facility provides controlled neutral buoyancy operations in the facility pool to simulate the zero-g or weightless condition which is experienced by spacecraft and crew during space flight. EPIC’s Safety Representative, Anne Penn, S&K Global Solutions Configuration Management Specialist, joined a tour of the facilities and learned about the unique set of safety concerns dealt with daily. One objective of the on-site safety committee meetings was to give the community a better understanding of the safety concerns in different work environments. The Neutral Buoyancy Laboratory control center within the Test Director’s Room. The NBL was built in 1996 and the pool contains 6.2 million gallons of water. It is 40’ deep, 101’ wide, and 202’ long, but this facility consists of much more than just the pool. There is a Test Conductor’s room used to view and monitor testing and a Test Director’s room used by support personnel conducting the test, which contains multiple monitors with views from every angle. Additionally, the facility has its own high bay used as a staging area for mock-ups. Currently, the pool contains a mock-up of the International Space Station. The NBL also has its own hyperbaric chamber to treat decompression sickness and contains a donning stand used to lower divers into the water. Each day that a test is performed in the pool, a Test Readiness Review takes place in the morning to ensure the safety of test participants, the equipment, and the facility. While originally designed for NASA use, the NBL has expanded to include a designated section for commercialized use, with Petrofac being the biggest customer. Overall, this facility faces multiple unique safety concerns every day, and they manage them with safety placed as their highest priority. They are an exceptional team and an amazing facility! Mike’s T-38. The Northrop T-38 Talon is a two-seat, twin-engined supersonic jet trainer that is the world’s first supersonic trainer and is also the most produced. The EPIC contract was also in attendance at the February Johnson Space Center Safety Action Team safety committee meeting. During the meeting, Anne Penn had the opportunity to tour and learn about the Ellington Field Joint Reserve Base aircraft and operations, and the safety concerns they routinely deal with. Pilot Mike Giles presented before the group and then gave a hangar tour where NASA T-38 Talons are stored. The Northrop T-38 Talon is a two-seat, twin-engined supersonic jet trainer. Everyone got a chance to see Mike in his very own T-38 with the added bonus of a close-up inspection of the plane’s cockpit and an explanation of how it all works. Some of the other aircraft that are stationed and used at Ellington Field include the WB-57 High Altitude Research Aircraft, C-9B, Gulfstream III, B377 Super Guppy Largeo Cargo Transport, and the T-38s. “This was by far the best safety committee meeting yet,” said Anne. 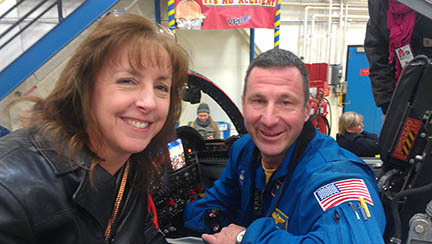 Anne Penn poses with pilot Mike Giles as he sits in the cockpit of his T-38.